Limestone is an ideal material for using outside as paving, as cladding, as building blocks and for sculptures or other bespoke works. The big concern for architects and specifiers is how the stone will weather over the life of the project. In the UK and northern Europe, frost can be a significant cause of damage to external stone so it is vital to choose a limestone that is frost resistant. 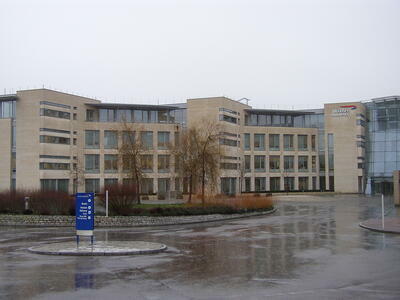 So, what is a frost resistant limestone and how does the specifier recognise it? It is not possible to tell from just looking and it is not true that the harder the stone, the better it will be. The only sensible way of knowing, with any degree of certainty, is to look at the frost test results and also to check existing similar projects to see how the stone has performed. The frost tests subject the stone to a series of freeze/thaw cycles and then carry out visual checks and mechanical tests to measure the effect of the frost on the stone. The British and European standard EN-12371 defines the exact method of testing. The frost test is an essential part of the CE Certificate if the stone is to be used externally. Frost resistance testing of natural stone is one of the most complicated tests that the stone industry conducts. Back in 2011, Barry Hunt from the consultancy company, Ibis, wrote an excellent article for the Natural Stone Specialist magazine which explained how the tests are carried out and why the results can be open to confusion. You can read his article here. In short, the same stone can react differently depending on whether it is dry or wet, on the speed of freezing and thawing, on atmospheric conditions and even on the shape of the sample. 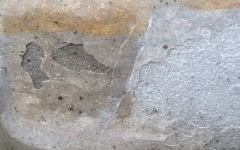 A saturated stone that is susceptible to frost damage is likely to be more severely and more quickly damaged by frost than the same stone when dry. How many freeze/thaw cycles before a stone is "frost resistant"? The Technical Director of the Marble Institute of America in 2012 published a paper saying that the majority of damage occurs between 50 and 125 cycles. This means that if a stone is susceptible to frost damage, the degradation will most likely occur between 50 and 125 cycles. This suggests to me that testing to 50 cycles or less does not prove anything significant. It really needs to be taken beyond 125 cycles or more to demonstrate that a stone can be called frost resistant. How many freeze/thaw cycles occur within one British winter? The answer is .... it depends - on where you are in Britain, on the local "micro-climate" and, of course, the severity of the winter. But if a stone fails the tests after just 50 cycles or less, it's easy to imagine that it might not last for more than a couple of years or so. Our French quarry partners often test their limestones to 140 cycles and even up to 240 cycles before they offer the stone as suitable for external use in a northern European climate. If a stone can pass the test at 140 cycles or, better still, 240 cycles and still show no significant problems, then we could realistically expect it to last for decades or longer. Some of the French limestones could last for a thousand years or more. It takes time, often many months, to repeat a number of freeze/thaw cycles and to measure the impact. The tests, therefore, can be expensive to carry out. The more cycles, the more expensive the testing becomes. A quarry company would have to be confident that their stone will survive and pass the tests for them to commit to the expense of extensive freeze/thaw testing. Q: Why is it that some stones are only tested to 50 or so cycles of freeze/thaw? A: This is satisfy the requirements of the CE certificate and to comply with BS EN13161, where the stone is tested for flexural strength. This test requires the flex strength to be measured before any freeze/thaw cycles and then to see if there are any changes after exposure to 56 cycles of frost (prior to 2010, it was tested to 48 cycles). The purpose is not to prove that the stone is frost proof or frost resistant but to test that the breaking load is not unduly affected. Q: Can we just use a thicker stone if thin stone is not frost resistant? A: I have often heard this said in relation to travertine. For internal use, the Turkish stone is usually just 12mm thick but for outside it is sometimes suggested that it should be 30mm thick. If a stone is susceptible to frost damage, it does not matter how thick it is, it will remain susceptible to damage. The surface will still spall when frosted but the theory is that it will take slightly longer before the stone has completely disintegrated. In reality, it can actually work the opposite way round - because a thin stone will dry out faster than a thick stone and wet stones are more prone to damage than dry stones. Q: If the stone is sealed, does this make it frost resistant? A: No, it doesn't make the stone frost resistant. In theory, it might help to keep moisture out from the surface of the stone. A dry stone is less prone to damage. But sealers do not last forever and as the sealer slowly degrades, the level of protection will lessen. Also, a sealer does not prevent moisture from entering a paving stone from underneath. If moisture gets in, and it certainly will do so over a period of time, the sealer can hold in the water and the problem can then become even worse. It is much safer to use a stone that is tested to at least 140 or, better still, to 240 cycles. Q: Does a cladding stone have to be as frost resistant as a paving stone? A: Cladding stones do get wet but tend not to sit in water the same way as a paving stone might do. Therefore, a cladding stone is less likely to be damaged to the extent that a paving stone might be. However, the result of a cladding stone failure could be far more serious than a paving stone failure. A cladding stone falling from a tall building could be lethal. Check the frost test results. Frost tests should show that the stone can withstand a minimum of 140 cycles of frost and, preferably 240 cycles. Check the empirical evidence. Visit sites where the same stone has been used successfully on similar projects in similar locations. This will greatly increase the chances of a successful, long-lasting project. This is one of the major factors but there are other considerations for using limestone outside. Our Guide for Landscape Designers covers some of the factors which will be useful to anyone involved in specifying natural stone for external use. 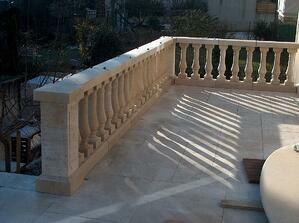 For more details of French Limestone, please visit our main web site. Did you find this article useful? If so, join our mailing list to get a copy of the next blog direct to your email inbox.